﻿ ﻿While riding through Yellowstone National Park last month, I spied numerous small snowballs that had tumbled down the hill along the side of the road. On closer look, they were like nothing I had ever seen before. "Stop the snow coach!" I blurted out and the nine of us piled out of the snow coach to spend some time photographing these curious snow formations. ﻿﻿After returning home I searched the Internet to learn more about these unusual snow formations. 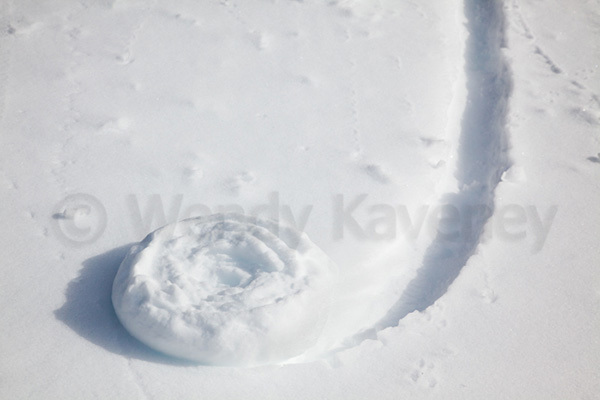 I learned that they are officially called "snow rollers," or "snow doughnuts." If they form in a wider shape, then they might be called "snow bales" or "snow logs. "﻿﻿﻿ Once the initial "seed" of the roller is started, it begins to roll. It collects additional snow from the ground as it rolls along, leaving a trail behind it. • The ground must be covered by a layer of ice to which snow will not stick. • The layer of ice must be covered by wet, loose snow with a temperature near the melting point of ice. 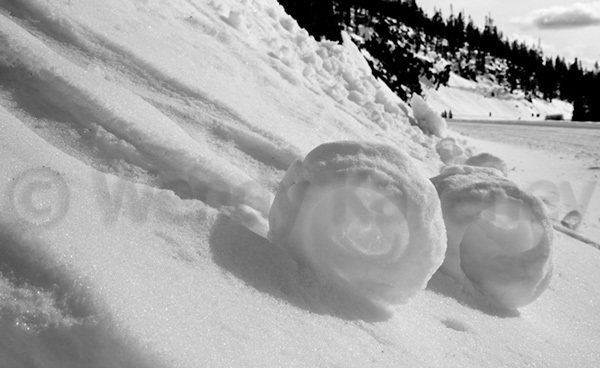 How fortunate we were to be in the park during those special weather conditions﻿ ﻿﻿in order to have seen and photographed these mysterious snow rollers! To see more images made on my recent Yellowstone trip, please visit my National Parks and Monuments collection. Fascinating! 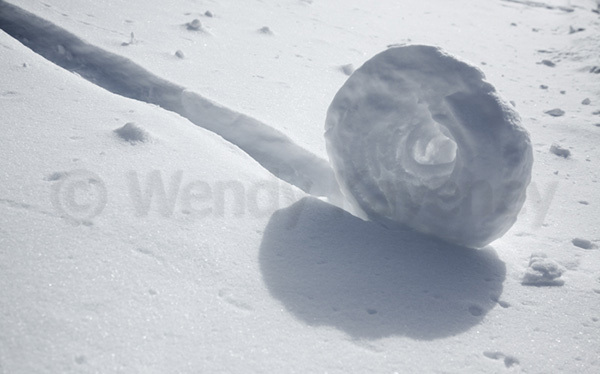 We experience snow rollers here in Ohio last night... they are all over the place!